I am commonly advised from reliable sources that British kayaker Peter Knowles introduced throwbags to the market on a wide scale with his green slime throwbags back in the 1980's. Before this time people made their own throwbags ranging from rope stored in an empty plastic bottle to a tennis ball with a length of rope attached to it. These were the tools you used to rescue your fellow rafters or kayakers when they had taken a swim. As with any sport our technical understanding of new techniques & materials has rapidly changed over the past 30 years. I myself partly owe my livelihood to the throwbag. I spend day after day teaching students on how to use a throwbag. Whilst delivering raft guide courses & Rescue 3 courses around the world some of the most common questions I am asked are: “Which is the best bag to buy” or “Which is the best throwbag”? I have decided to compile this article to help you make an informed decision when purchasing your next throwbag or deciding which throwbag to use. 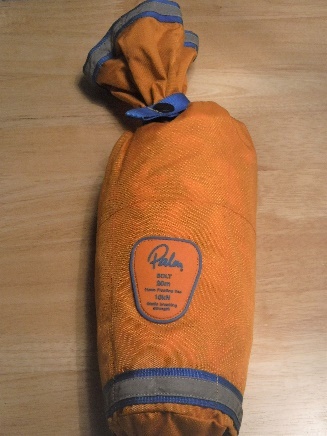 A throwbag simply consists of a bag of floating rope to be thrown across a stretch of moving or still water to make a conditional rescue with a swimmer. The condition being that the swimmer is able to hold the rope. The rope inside a throwbag must be able to do 2 specific jobs Float and be Visible. Imagine throwing a rope to a swimmer only to see it sink to the bottom of the river rendering it useless to the person who needs rescuing. All throwbag ropes must contain properties that make them float. The most common ropes contain a high amount of the material called polypropylene. Polypropylene has excellent floating properties this will allow the rope to stay on the surface of the water so that your swimmer is able to hold on to the line. Polypropylene has 2 big disadvantages. Polypropylene has a very low melting point so introducing friction to the rope is not a good idea. Compared with climbing Dynamic (stretchy ropes) or abseil Static (Non-stretchy ropes) Polypropylene is not very strong your average 8mm-11mm diameter polypropylene ropes have an unknotted static breaking strain of between 8kn -13kn that’s 800-1300kg compared to most static abseil ropes that have a static breaking strain of >25kn. When researching which bag to purchase you may want to spend some time looking at what you will be mainly using the bag for. The rope must be highly visible Most rope manufactures use a yellow base as it is easy to see in a variety of different water colors. The NRS Pro rescue NFPA bag for example has yellow as the main color of the rope with a red braid running through the rope. The red braid is multi-functional not only does it make the rope more visible, but the braiding is raised from the rope to promote extra grip when using the rope. The bag itself plays an important role. The shape of the bag must be aerodynamic to fly through the air easier when been deployed. Most bags are nowadays a tapered cone shape. The Bag needs to be a bright color & highly visible. The neck or opening of the bag must be secure so that the rope does not escape and cause a snag hazard. The neck must also be wide enough for the bag to be repacked easily with wet cold hands. No matter what anybody tells you. Unless your bag says so the rope inside is not rated for climbing or abseil use. Abseiling on throwbags is not a good idea. Polypropylene rope does not like friction. Old , Knotted , dirty ropes ingrained with sand & UV damage will have a much lower breaking strain than the strain than the figures mentioned on the bag. In the mid 1990's there was a shift away from having a handle at one end of your throwbag. Several cases emerged of the handle becoming a snag hazard and causing injuries & even fatalities on the river. The industry took note and decided to no longer tie a handle in the end of their throwbags to reduce the chances of the bag snagging should the end become loose in the water. To this day some of the major manufactures at the request of their emergency service customers still tie a handle into the end of their new throwbags. This is an informed choice on behalf of the user. Your throw bag should not have any loops at either end of the rope that are big enough to put a small hand through. This includes the bag end of your throwline. Like most things in life a product that works for one person may not work for another. The same can be said about throwbags. In an extreme way of thinking the ability to successfully deploy your throwbag when needed literally could mean life or death! It is important that you choose a bag that you are able to throw the furthest distance. A small framed person with small hands may have a problem throwing a 25m wet 11mm diameter rope. Yet the same person may have more success throwing a 15m wet 9mm diameter rope. A good friend once told me when choosing a throwbag apply the following rule. “Small hands = Small rope. Big hands = Big rope”. The ability to efficiently manage your rope with wet cold hands is important. Thinner ropes 10mm< tend to be lighter and easy to carry. Ideal for those who want to wear a their throwbag on a waist mounted belt. Thinner lighter ropes can generally be thrown a further distance, but they do tend not to be as strong as the thicker ropes. This may be true. If the rescuer suffers from rope burn they may need to look at their belay stance & technique. Let’s be honest I am sure most of us would take a little friction burn to the hands than a nasty swim down a rapid any day. With the help of some generous throwbag manufactures and a group of willing Indian raft guides I managed to practically test a wide range of throwbags ranging from the classic popular bags to a few fresh new faces on the market. I supplied a selection of 11 throwbags to a team of 9 raft guides who were about to take the throwbag assessment as part of a recent International Rafting Federation GTE workshop in India. The retail market for rafting & kayaking equipment in India is tiny. Most local guides have to make do with hand me downs from travelling kayakers or guides. I had a truly unbiased test base. These are the results from the most popular bags out of the 11 tested. This bag proved to be one of the most popular models amongst the guides. When I asked them what they liked so much about the bag the responses were. Mark's opinion - Wherever I travel in the world somebody has a weasel this has to be one of the biggest selling throwbags of all time and probably for a reason. However, HF insist in having a plastic piping around the loop on the bag end of the line this automatically creates a snag hazard. I always advise my students to remove the plastic piping and re- tie the handle to create a smaller loop. The relatively new to the market the Palm Lightning is again very popular. The lightning is very comparable to the HF weasel in design with a few extra add-ons that make this a good bag. The wire rim on the opening allows a large area for quick repacking after been thrown. The magnetic closure system feels great and was easy to operate with wet hands. Mark's Opinion - Palm have a reputation for attention to detail in their designs. The Lightning is proof of this. I remember in years gone by the frustration of repacking a Palm throwbag & struggling to be able to fit all of the rope in through the narrow neck. A simple design change has eradicated this issue. 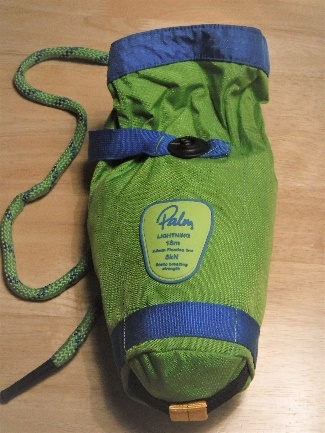 I also like the fact that all palm bags now have a totally clean bag with bag end loop made from webbing reducing the opportunity for snagging. 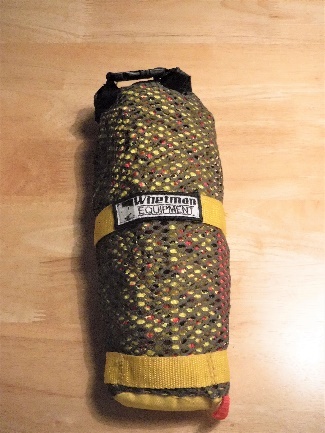 Whetman equipment are a relatively new company to the throwbag market. Although Steve Whetman is himself a veteran kayaker. The Tapir is an instant eye opener as instead of having rope the bag contains 18m of flat floating webbing. A huge positive for the tapir is the fact that the bag is made from mesh allowing it to be quick draining and very light. Guides opinion - “Very comfortable & Light to wear around the waist. “So, light I had to thoroughly wet the bag before I threw it” “The closure buckle was easy to operate with wet hands. Mark's opinion - For anyone who has a really poor throw that lacks distance this is the bag for you. The combination of ultra- light webbing and a mesh bag make this one of the lightest bags I have ever put my hands on. At first, I was not sure that the bag was going to last a week of hard use with it been so light but it the bag managed fine. In-fact when I offered the photographer a bag as payment for his pictures he chose the Tapir 18. Bags from the whitewater training centre (WWTC) have been a popular with the guide community for some time now. Recently the emergency services have started to follow the trend. WWTC bags are stored in a PU storage system on the waist which is very hardwearing an also has the option to have a flip line pocket added to the waist belt if needed. The bag is easily secured to the carry system and has the ability released quickly when needed. WWTC have created the braid of their own rope to make it one of the strongest 8mm ropes available on the market. The glow stick storage loops & padded carabiner park also get a thumb’s up. Mark's opinion - When I see a guide wearing a WWTC bag I know they have done their research before buying the bag. I have used the same WWTC bag for full time use for the past 5 seasons. WWTC bags are mixture of intelligent design & durability. The go to bag for many rescue teams operating in Austria & Germany. This is a true professional rescue bag. After removing the plastic piping from the bag end this the workhorse of big bags. The clever handles in the neck of the bag allow for quick repacking and can even be used when throwing the bag. The 11mm rope with core floats really well and with its 13kn static strength is ideal for MA systems and hauling both rafts and kayaks around the river or river bank. Mark's opinion - I like this bag, I am a fan of the 11mm rope for all round use. As with some of the guides I normally pay out a few meters before throwing to make the bag easier to throw. The handles on the neck are one of my favourite details to this Bag. Mark's opinion - “The pro rescue bag is great for first time users on training courses the bag is easy to throw & Repack. As with the HF Bags you need adjust the loop at the bag end of the rope before use to make the knot safer & smaller. I really liked the raised red braiding in the rope which helps with grip when belaying. Big thumbs up to NRS for using the Sterling grabline rope. The big brother to the lightning bag the bolt is 20m in length with a 11mm rope. This bag is highly popular with kayakers. The bolt has the same magnetic closure system & the same webbing end loop that sits flush with the bag to reduce snag hazards. Mark's opinion - I found this bag a little hard to deploy with an over hand throw. The bolt was perfect when throwing under arm. Again, from palm a well thought out & stylish piece of kit. I just wish they could have used the same wire in the neck to help with repacking as they did on the lightning bag. Mark's Opinion - I was a little sceptical of the end of the stainless-steel ring hanging out of the bottom of the bag to start with. 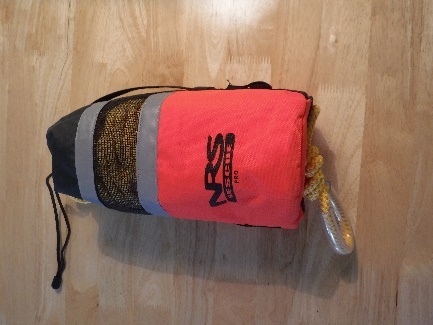 Having used the bag on a whitewater rescue course I found it to be really easy to work with. This Peak Uk bag was great for explaining to students how the rope and bag should be tied to the bag & how easy it should be to take the rope off from the bag when needed. Mark's opinion - This bag is a great bag to pull out on a rescue course. The craft 27m is easy to re-pack. The 10mm rope is great for handling as a rescuer or swimmer and is not afraid of dealing with big loads. The storage system that fits around a raft cross tube looks so professional & works really well. Hopefully now you have a little more knowledge when it comes to choosing a throwbag. Always try to use a few different bags before you make a purchase. Choose a bag that works best for your throwing ability & style. The biggest tip I can give to anyone is to attend a rescue class in order to gain the correct education on throwbag use. It is then up to you, your fellow raft guides & kayakers to practice, Practice, Practice. Mark is an avid boater and swift water rescue instructor. His company Lapin Koskikoulu offers a wider range of activities from internationally certified & recognized rescue courses through one on one personal coaching. Mark's main goal is to provide people with a fun, safe, and educational environment designed help to develop boaters skills. Mark runs our courses all over the world including destinations such as: Finland, Iceland, India, Nepal, Wales and Morocco.